These lamb sliders were adapted from my Lamb Lettuce Wraps Recipe where I took the meat mixture and simply added feta cheese and shaped into small burgers. I love when I can recreate multiple recipes from one dish! Add feta cheese, lemon juice, lemon zest, oregano, sea salt, black pepper, balsamic vinegar, and coconut aminos and mix well. Form meat mixture into small 1-2 inch burgers. Heat ghee in skillet and when melted add the burgers, cooking a few minutes each side until golden brown. 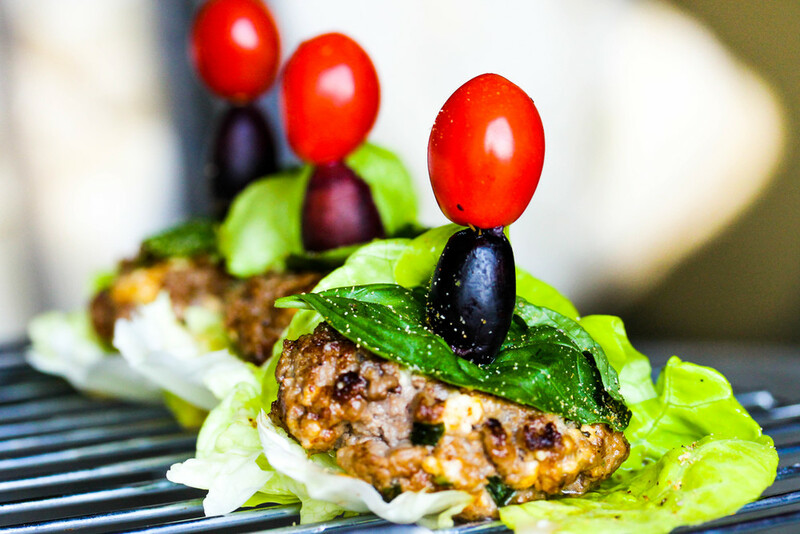 Serve burgers on top of bib lettuce leaves and garnish with a tomato, Kalmata olive, and Garlic Lovers seasoning. Simply click on the images below for a step-by-step process for making Lamb Sliders.